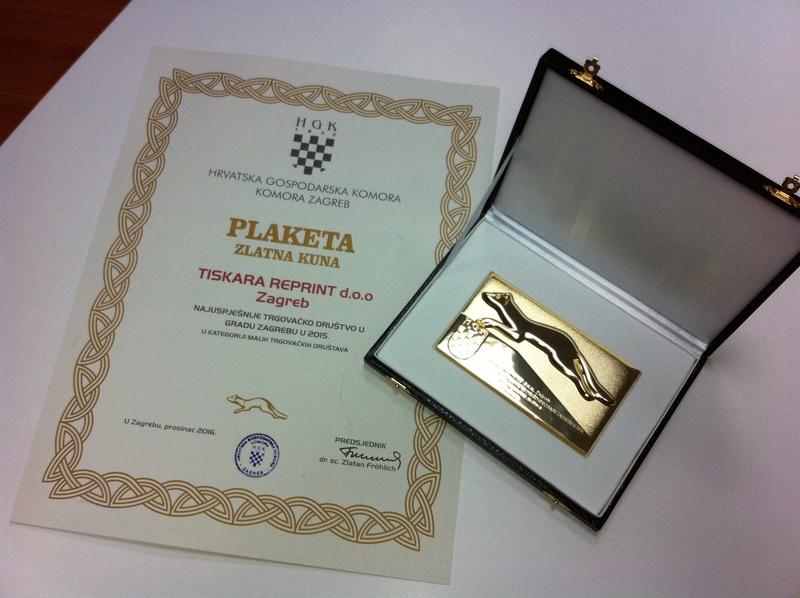 Tiskara Reprint has been awarded „Golden kuna“ (“Zlatna Kuna”) in the category of small companies, for its business results in 2016. The plaquette „Golden Kuna“ Reprintu has been given at the ceremonial session of the Business Council of the Chamber of Zagreb. Tiskara Reprint has found itself shoulder to shoulder with the most successful big, middle and small enterprises from the City of Zagreb and Zagreb County for the achieved business results in the last year: Kraš, Feroimpex, Automobilska tehnika, Span, MM mesna industrija and Ivanićplast (which is already in business for 110 years). Tiskara Reprint is systematcaly spreading to new markets. Accordingly, it employs new workers. In 2012 there were around forty, in 2014 there were 62, and today there are already 74. The President of the Board of Tiskara Reprint Tomislav Matijašević says: „It is the result of optimisation of production processes and introduction of new IT solutions, plus introduction of new marketing techniques and channels, especially toward foreign markets.“ The director Darijo Klemar adds that the growth was also supported by successful withdrawal of grants from EU and similar funds.